Having won the TV Show, The Big Big Talent Show, Paul's ventriloquist act has lead his career performances in a range of prestigious venues, from Royal Variety Performance to the BBC One's The One Show. Paul Zerdin was the first winner of ITV programme, The Big Big Talent Show. The UK's number one ventriloquist's career has included appearances on everything from the Royal Variety Performance, Paramount and Comedy Central's, The World Stands Up to ITV Daybreak, BBC TV's The One Show, Sky News and Jason Manford's Comedy Rocks. With Paul’s winning combination of technical skill, hilarious ventriloquism, charm and impeccable comic timing, Paul Zerdin’s live shows see him bring to life a diverse range of characters. Paul Zerdin has helped make ventriloquism cool again. From the Royal Variety Performance to the Edinburgh Fringe Festival, to India’s comedy circuit, Montreal’s Just For Laughs and UK tours with his Sponge Fest show and forthcoming Puppet Master tour. Paul’s fresh twist on this traditional comedy art has impressed everyone from Her Majesty the Queen onwards. Crucially, Paul Zerdin appeals to both comedy club and mainstream audiences in equal measure. The UK’s number one ventriloquist’s career has included appearances on everything from the Royal Variety Performance, Paramount and Comedy Central’s, The World Stands Up to ITV Daybreak, BBC TV’s The One Show, Sky News and Jason Manford’s Comedy Rocks. 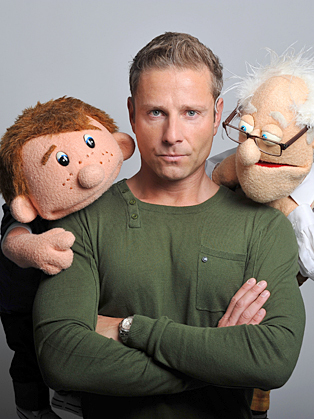 With Paul’s winning combination of technical skill, hilarious ventriloquism, charm and impeccable comic timing, Paul Zerdin’s live shows see him bring to life several very different characters amongst whom are the cheeky pre-adolescent Sam, belligerent OAP Albert and precocious infant Baby and in 2012 on his Puppet Master live tour, Paul will be introducing a new character! “I see myself as a one man Muppet sitcom, reining the characters in” commented Zerdin. “The old man has a thing for the ladies and so does Sam who is about to become a teen and knows naughty words. Between the two of them they lead the baby astray and the baby, of course, wants to know everything. I think it is important to have characters that people can relate to rather than, say, talking sheep which are less believable”. Zerdin, who got the ‘biggest laugh of the night’ at the Royal Variety Performance in 2009, according to audience members, also went on to get 5 star reviews at that year’s Edinburgh Festival. Paul returned to Edinburgh to sold-out houses in 2010 and made his debut at Montreal’s Just For Laughs Festival that year before embarking on a major UK tour with Sponge Fest in 2010/2011. That Paul Zerdin should make his career in show business is not entirely unexpected “my mother was a BBC Radio 2 presenter and my father worked for the BBC World Service, so my sister and I spent a lot of time in the studios”, he reveals. Having failed his GCSE’s in spectacular style, Zerdin got a job in a magic shop, developing his magic skills along the way. Simultaneously, he was also developing a sideline as a children’s entertainer. “Compared to my friends and their measly paper rounds, I was raking it in!” he laughs. Zerdin made his TV debut as a magician on the BBC’s Tricky Business and shortly afterwards, at the age of just 20, landed a two year contract presenting the Disney produced kids’ programme Rise and Shine for GMTV. In 1996, Paul was the first outright winner – by over 100,000 votes of LWT’s The Big Big Talent Show, hosted by Jonathan Ross. The experience not only raised his profile, but introduced him to Nigel Lythgoe, the man who would go on to create reality shows such as Popstars and American Idol. Lythgoe took the 22 year old Paul under his wing, paving the way for appearances on scores of shows, Tonight at the London Palladium, and Generation Game among them. It was Nigel who gave Paul his first brush with Royalty when he secured him a spot on the Prince’s Trust Gala Show in 1997. “That was a totally surreal experience”, he laughs. “I was sharing a dressing room with Julian Clary, Alan Davies and Frank Bruno with The Spice Girls next door”. By the late nineties it was obvious that traditional variety shows were losing their appeal and it was then that Zerdin decided to introduce stand-up into his routine, a decision that has paid off handsomely. From Ray Alan through to Keith Harris, ventriloquists have been a staple of UK entertainment for years, but it has taken Paul Zerdin to bring his mix of stand-up and ventriloquism to the forefront of contemporary entertainment to truly put ventriloquism on the comedy map. More recently, Paul Zerdin was the runaway winner of America’s Got Talent 2015, with his auditions racking up millions of YouTube views. The end of 2015 saw Paul headline the legendary Planet Hollywood in Las Vegas before returning to the UK to appear on Michael McIntyre’s Big Christmas Show for BBC1, and an announcement of his hotly anticipated 2016 UK tour. Star of 3 Royal Variety Performances, Paul remains hugely in demand at home as well as in the US.